From morning til night, we never stop executing movements at the right time and speed. But patients suffering from Parkinson's disease lose this natural control over their voluntary movements. Parkinson's is caused by the death of the neurons that make a neurotransmitter, dopamine, in a region of the brain called the substantia nigra. Now a new study, published by scientists from the Champalimaud Centre for the Unknown (Portugal) and Columbia University's Mortimer B. Zuckerman Mind Brain Behavior Institute in the journal Nature, represents an important step towards better understanding the precise normal function of these neurons. Experts have long worked to understand why the absence of these so-called dopaminergic neurons (and therefore, the lack of dopamine) leads to the motor dysfunctions that are the hallmarks Parkinson's, such as stiffness, slow movements and tremors. The more widely accepted explanation has been that, in order to move normally, our brain constantly needs a certain level of dopamine - something that Parkinson's patients progressively lose. However, as psychiatrist and neuroscientist Joaquim Alves da Silva, first author of the new study, explains, people with Parkinson's disease actually "do not have a global motor problem." As incredible as it may seem, they can even ride a bicycle—a rather complex motor task—if pushed at the right time. The motor problems that Parkinson's patients experience are more specific, and this was the observation that motivated the new study. "The patients' problem is in the difficulty to initiate movement and in the slowness of movement," adds Alves da Silva. In fact, as these authors now showed in mice not afflicted by Parkinson's disease, for a movement to unfold correctly it only takes a "puff" of dopamine—or more precisely, a peak of dopaminergic cell activity—right before the movements starts. In other words, dopamine (or, in this case, the activity of the cells that produce it) is just a "trigger" for voluntary movements. "Our most important result is that we showed, for the first time, that the change in neural activity is necessary to promote movement," says Alves da Silva. "And also for the first time, we showed that the dopamine peak that precedes movement initiation does not only regulate initiation, but also regulates movement vigor." Previous results already pointed in this direction. "Our laboratory and others had shown that, in normal conditions, there is a transient increase in the activity of dopamine-producing neurons, and that this increase seems to precede movement initiation," says Alves da Silva. "But we still had to determine whether that neural activity was mostly important to initiate movement or if it was also important during movement execution," he adds. The scientists performed their experiments by using optogenetics, a technique that allowed them to turn neurons on and off very quickly with laser light. "In this way, we were certain that we were only recording the activity of the animals' dopaminergic cells" in the substantia nigra, explains Alves da Silva. The mice were placed in an "arena" where they could roam freely. By using motion sensors, the authors then measured whether the animals were moving or not at any given moment. They recorded identified dopamine neurons and were able to observe a transient peak of activity in many of these cells before the movements. In the next phase, the scientists activated or inhibited the dopamine cells with a laser. 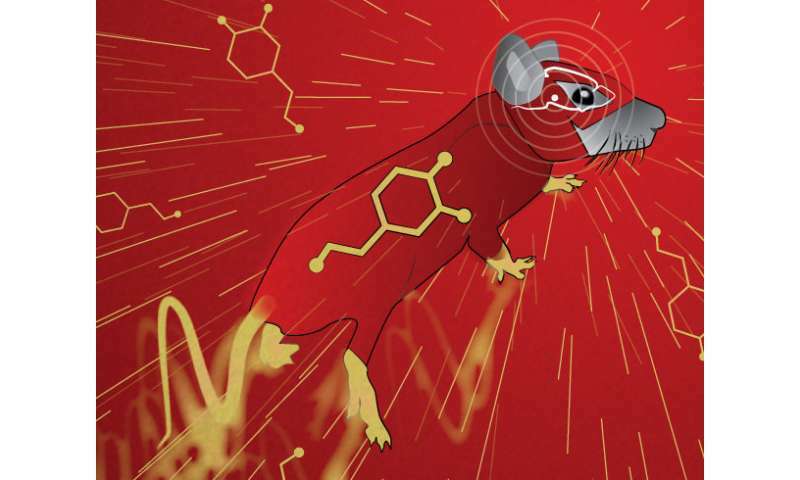 And they could then see that when the mice were not moving, "activating the neurons for half a second was enough to promote movement—and with more vigor—than without these neurons' activity," says Alves da Silva. However, if the neurons were activated when the mice were already moving, the animals "just went on doing whatever they were doing" in terms of movement and movement vigor, as measured by acceleration. Moreover, inhibiting the neurons' activity during an ongoing movement did not have any effect on its normal execution. "These results show that the activity of dopamine neurons can act as a gate to permit or not the initiation of movements," says Rui Costa, DVM, PhD, associate director of Columbia's Zuckerman Institute who led the study. "They explain why dopamine is so important in motivation, and also why lack of dopamine in Parkinson's disease leads to the symptoms that it does." The authors say the new study could pave the way for the development of treatments for Parkinson's disease with fewer side-effects. Currently, Parkinson's is usually treated with the drug levodopa, which works by boosting dopamine in the body and alleviating symptoms. "But levodopa elevates dopamine all the time, not just when we want to move" says Costa, who is also professor of neuroscience and neurology at Columbia University Irving Medical Center. And indeed, the long-term use of levodopa often causes other motor disorders—mainly, erratic and involuntary body movements known as dyskinesia. "Our study suggests that strategies that would boost dopamine when there is a desire to move would work better," adds Costa. When patients do not respond to or cannot take the drug, there is an alternative treatment, called "deep brain stimulation" (DBS). For this, patients are implanted with a high-frequency pacemaker that blocks the abnormal electric signals generated in the brain areas that control movement and make it difficult for the patients to initiate movement. It is known that DBS substantially improves parkinsonian symptoms—but it can also have adverse effects. This study suggests that it may be better to stimulate the brain only when patients want to initiate movement, promoting not only initiation but also controlling the vigor of the movement. If this possibility were to be confirmed, it could render DBS more physiological, more natural, so decreasing unwanted side-effects. The paper is titled "Dopamine neuron activity before action initiation gates and invigorates future movements." Additional contributors include Fatuel Tecuapetla and Vitor Paixão.